People who seldom visit artists in galleries will meet them face to face on Market street next week. 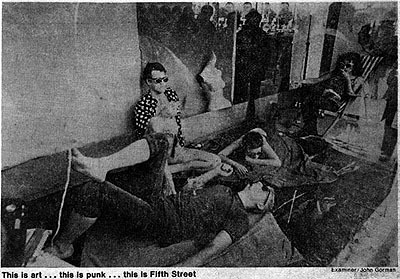 A group of Bay Area performance artists will dust off the long abandoned sidewalk display windows of the old J.C. Penny store at Fifth and Market and advertise themselves and their audiences. "Performance art" may involve drama, music, costume, an event that invites the observer to discover the artist, or discover himself. 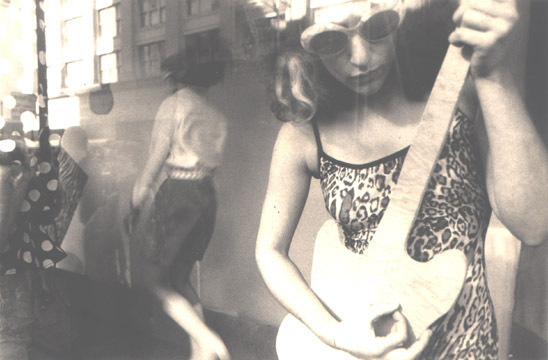 San Francisco musicians Tuxedomoon and artist Rachel Webber will create their "message for Market street" under glass from 10 o'clock to 5 p.m. Wednesday, January 24. 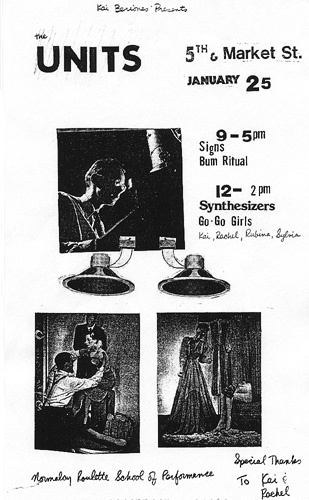 The Units from Redding will bring two synthesizers into the windows on January 25, Thursday, adding their performance to Kai Beriones and Rachel, Sylvia, Rubina. Special help from: Kal Berlones, Scott Ryser, The Units, Tom Matty, Ernest Fritz and Diane Daniels. Windows organized by Michael Osterhout. The piece took place inside the display windows of the J.C. Penny building, downtown San Francisco, from 10:00 a.m. to 5:00 p.m. The audience was anyone who happened to be walking by on the street. I painted the windows black on the inside. 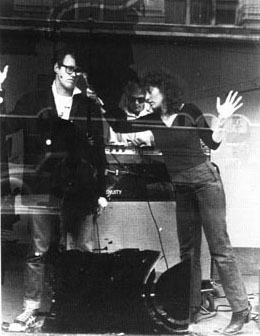 About seven people came on the day of the performance to participate. I instructed them to stand very close to the inside of the windows. I began to scrape away the paint which revealed certain parts of their bodies on the the outside of the windows. Behind them on the walls of the display area, I projected slides I had taken previously at the windows of people walking by on the street, among other slides I had taken. 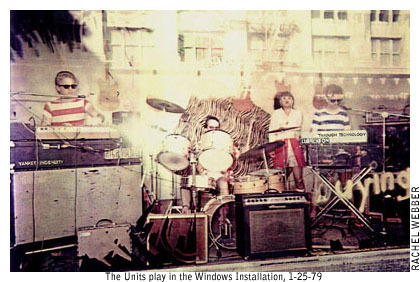 A San Francisco synthesizer band called the Units were simultaneously playing their music which helped illustrate and enhance the mood of the action. As the day progressed, more paint was scraped away and more of what was behind the glass was revealed to the public. The piece ended when there was no more paint on the windows. The windows had been painted black, and then much of the paint was scraped off. The scraping was part of the live artwork from the day before. 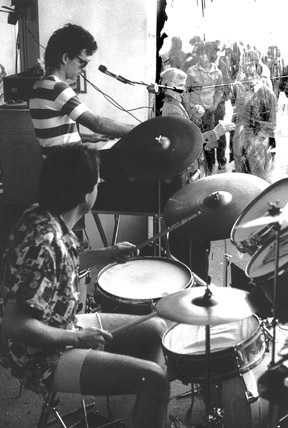 Behind the center window stood the band, two on keyboards and one on drums. Behind them were a fake and ugly tigerskin and some plywood guitars -- without strings. And atop one of the electric keyboards stood a plastic champagne glass and a carton of milk. Beginning to feel the mood? 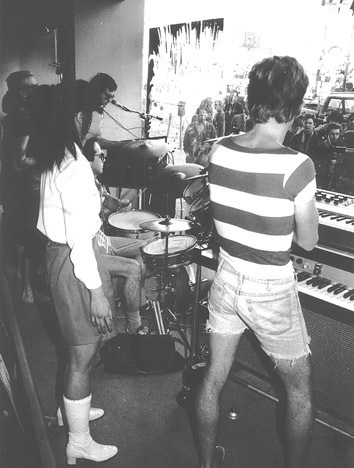 At window right, there was a beach chair, a sun lamp -- not plugged in, and four people in sunglasses and beachwear. They were sunbathing. As time went on, they took the plywood and posed with them in playing position. But they didn't play. 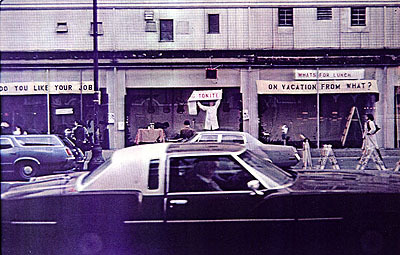 Above them was the banner: "ON VACATION FROM WHAT?" At window left, there was a model in a platinum wig and a go-go dancer. Above them was a banner: "DO YOU LIKE YOUR JOB?" "It's a holiday theme -- on vacation." Berlones explained backstage. "Its just such a great space, you have to ham it up." Is there a greater message to all this, or is it just entertainment? "I hope people get enterainment -- diversion." She said some philistine across the street called the police on them -- complaining of too much noise from the loudspeaker outside the window. Too much noise at Fifth and Market? Has he no appreciation of art? How do you like it? We asked a woman who walked by. "Well..." she said, and there was silence. "I'm a fan of South and Market," she said. 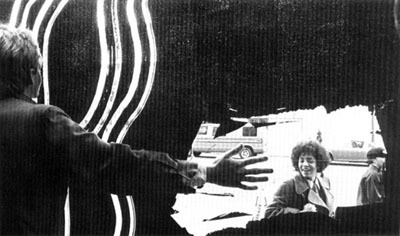 "I like street theater. This isn't really street theatre -- It's window theater." What do you think of the show? we asked a young woman who was feeling the rhythm and hugging a parking meter. Her name was Candy. "It's not a show. It's an exhibit," she said. "Listen to the words. They're in there because they can't be out here because in there there is air. They only way you get air is air conditioning." We were still digesting that while she continued. "The people over there (she said pointing to the window left) are in a bar, they don't know what's going on over here (pointing to window right). Vacation. Like it says, vacation from what? You come back from vacation to this bull.."
Did you just wander by?